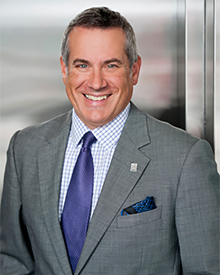 Alain Doucet, MBA brings over 25 years of senior leadership, marketing, business development and relationship-building experience to his role as President and Chief Executive Officer. Alain joined the College after a 14 year tenure at the University of Ottawa where he was most recently Assistant Dean, External Relations for the Telfer School of Management. Prior to holding these positions he was Vice President, Marketing and Communications at Orbit IQ, General Manager at Banfield Seguin, an Ottawa-based marketing & communications agency, and Vice President, Marketing at ADVENTIS, a Boston-based global consultancy to the telecom, technology and information industries. Before moving into senior leadership positions, Alain held various product and marketing management positions in the financial services, business services and consumer goods sectors. Alain holds a BCom (Honours) in Business Administration from the University of Ottawa (1983) and an MBA (with Distinction) from the Johnson Graduate School of Management at Cornell University (1987). In his spare time he enjoys golf, travel, playing the saxophone and reading. His wife Christine is Vice President of Finance at MD Management and he has two sons who are enjoying the young professional life in Toronto. Connect with Alain on LinkedIn or follow him on Twitter. You can reach Alain directly at adoucet@cchl-ccls.ca, or 613-235-7218 x 224.